What is the Healthier Hospital Initiative? 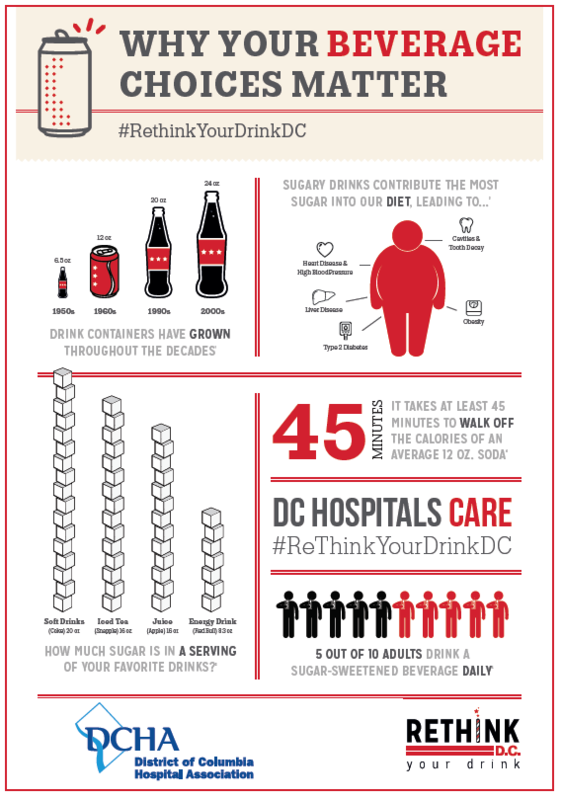 The Healthier Hospital Initiative is a partnership between the District of Columbia Hospital Association and the DC Department of Health to reduce the availability and consumption of sugar sweetened beverages, and to promote healthier choices in district hospitals. More than half of District residents are overweight or obese, and diabetes is the sixth leading cause of death. Research shows that decreasing sugar-sweetened beverage consumption can lead to lower rates of chronic disease and obesity. In order to continue the mission of our District hospitals to promote health and healing we will increase and promote our healthy beverage offerings to make the healthy choice the easy choice for our patients, staff, and community. 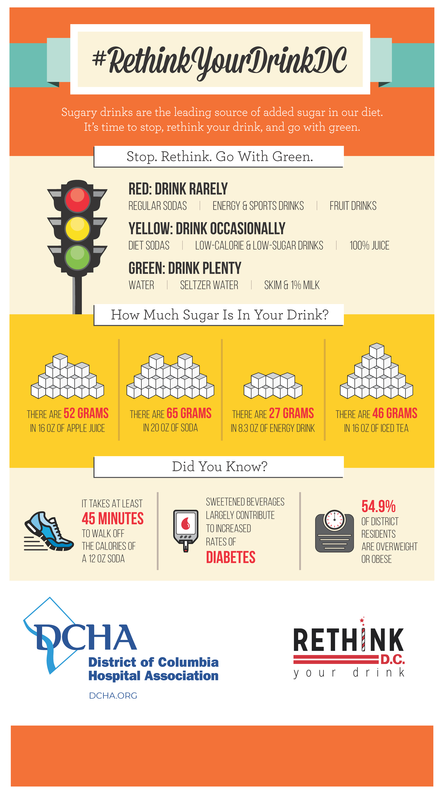 What is a sugar sweetened beverage? Any beverage in which sugar has been added such as soda, juice drinks, sports drinks, flavored milks, and energy drinks. These beverages often have no nutritional value. What if I still want a regular soda or other sugar-sweetened beverage? Sugar-sweetened beverages are still available, however our dining venue wants to promote healthier options. Employees, patients, and families are still permitted to bring their own beverages into the hospital. What is the best beverage for me to drink? Water is always the best option. Water makes up about 60% of your body weight, and your body depends on it to survive. The amount that you should consume varies by person, climate, and activity level, however the Institute of Medicine suggest at least 15 cups of water a day for men, and 11 cups for women. Note that these recommendations include water from food. Aren't diet beverages just as unhealthy? Diet beverages are generally sweetened with sugar substitutes, and provide no added calories. Artificial sweeteners are regulated by the FDA, and they are deemed safe. With this initiative, our main objective is to reduce obesity and diabetes rates. The link between sugar-sweetened beverages and chronic disease is clear, and evidence shows decreasing intake of added calories from sugar-sweetened beverages can lead to better health outcomes. I need caffeine! What are the alternatives? Be mindful of your body. We may think we’re tired and need a “pick-me-up,” instead, we may just be distracted. Try a flavored seltzer, or ice cold water to refresh yourself. You can expect to see healthy changes in all hospital dining venues, vending machines, and catered meetings and events. A variety of healthy beverages including water, unsweetened tea, coffee, 100% fruit juice, milk, diet and zero calorie soft drinks, and sparkling water will be offered throughout all hospital dining venues and vending machines. 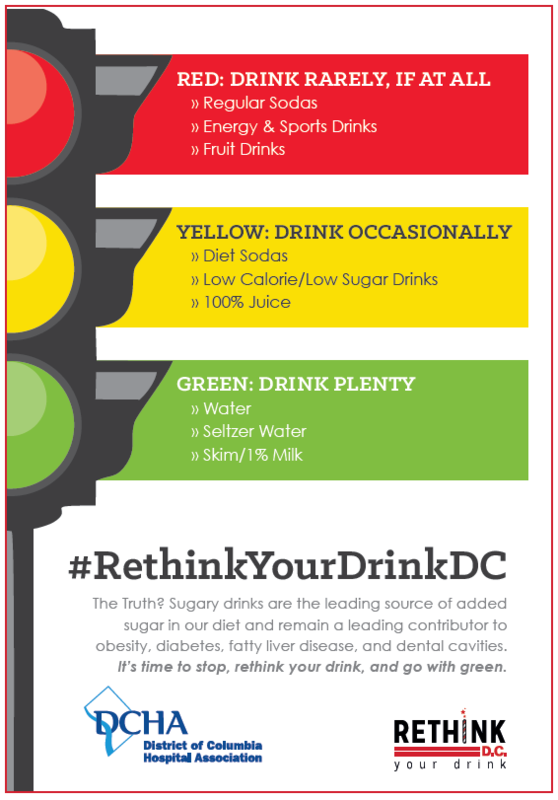 If you are interested in learning more about healthier beverage options, try www.revyourbev.com. All hospital catering for meetings and events will also follow the healthy beverage policy. Healthy beverages will be placed more prominently in all dining locations to make healthier options easier to find and identify.